LÝ SƠN ISLANDS — Underground water in the Lý Sơn Islands, 30km off the coast of Quảng Ngãi Province, has become seriously salinised in the early dry season this year – the worst in the last three – as demand for water has exceeded current underwater reserves. The underwater level is 5m lower than in the previous three years, and salt has been detected at depths of up to 35m. Vice chairwoman of the district’s people’s committee, Phạm Thị Hương, told Việt Nam News that water for agriculture production and residents was estimated at more than 21,000 cubic metres each day, while underwater reserves held only 15,600 cubic metres. Thới Lới Lake, containing 270,000 cubic metres of water, was reserved for 300ha of garlic and purple onion farms – the two major crops on the islands. Hương said local farmers had to dig more wells for their farms to deal with the water shortage. Islanders had manually dug 939 wells, and more than 1,000 wells were drilled to get water from underground reserves. 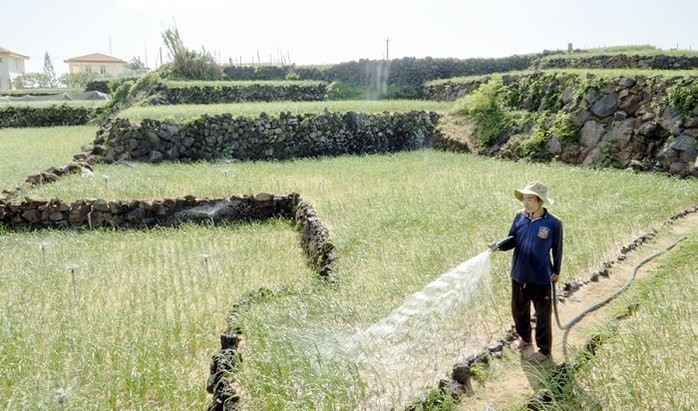 “We warned farmers to change to other crops including pea and maize that use less water than onions, while trying to save water,” Hương said. “The district had submitted a plan to the government to build a US$12 million sea water desalination project to supply fresh water for residents and tourists during the summer,” she said, adding that they were also seeking effective measures for water conservation. Hương said the Islands reduced coverage of purple onion crops from 170ha to 50ha to deal with salinisation last year. In 2012, islanders in An Bình Islet, 4.8km off Lý Sơn Islands, were able to use fresh water from the South Korean heavy industries group Doosan Vina-funded desalination station project. The islet also started using power from a solar power system in 2017. The development of a drainage recycling system and more water containers are positive measures to save water during droughts. Farmers on the islands produced 2,500 tonnes of garlic and 6,500 tonnes of purple onion for both home and foreign markets last year. The island, known as the Kingdom of Garlic in Việt Nam, has around 22,000 inhabitants, of whom 73 per cent make their living from farming garlic and spring onions, alongside fishing.